I have a series of bird feeders that I can see from my kitchen window. This year, I am concentrating on luring Goldfinches to these feeders. 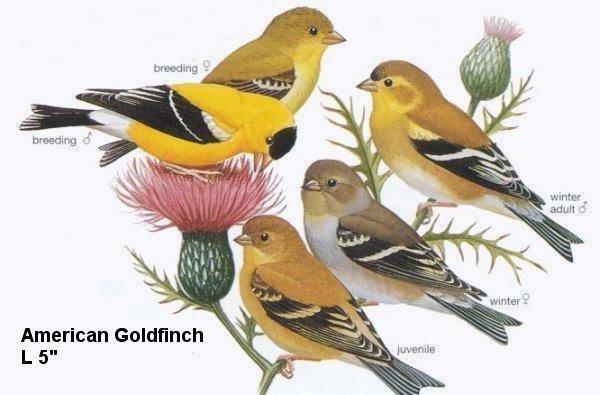 I have, according to the FAQ I recently read about attracting them, done everything right: I have a feeder specifically for Goldfinches that has a bright yellow top and is full of nyjer, a feeder of black sunflower seeds, a feeder of “Finch Supreme” mix, a water source that I keep free of ice . . . but no Goldfinches. There was one the other morning and I was so excited, creeping toward the kitchen window to get a better look, no sudden moves to catch its attention and scare it away. It ignored the Nyjer (is the seed too old?). It lept from the fence to the big hook that holds the feeder. It tested the Finch Supreme mix but seemed unimpressed. It lept back to the fence and hopped down to the hardy Jasmine vine, worked its way along the vine toward the big ceramic pot that holds my mosquito fish and is heated to the point that it steams like a dragon’s nostril on cold mornings. There is even a water lily sending up leaves to the surface. Earlier in the season it held two frogs that would cool their backs in the frigid air. I hope they left for their soil cocoons when we turned off the heater during cool days that stayed above freezing. The Goldfinch lept to the lip of the pot and looked down at the water as if to say, “How am I going to manage to drink from this? !” but it quickly figured things out and It worked its way around the lip of the pot to the place where the black cord goes into the pot and down into the water to the pond heater. It hopped to the cord and inched its way down to the surface of the water, took a drink. A second drink. Then off it flew with a thrum of its wings. But the feeders are lonely of Goldfinches. Throngs of sparrows fight over the Finch mix, Cardinals and Jays like the sunflower seeds. My Nyjer must be past its day. How do they know without tasting? “At least taste,” I think to myself. Maybe they do when I’m not looking. My friend Beth say she has “mobs” of Goldfinches. Never has the word mob sounded so lovely to me. I want mobs of Goldfinches, too. I think of those stacks of knitted yellow sunflowers I’ve got from the days of working on the book of knitted flowers, Noni Flowers. I get to thinking. Would a Goldfinch be beguiled by a knitted sunflower? And in the middle of Winter? I’ve got my plan. Join me here next week for a plan update. This entry was posted in Family, Nora by njbellows. Bookmark the permalink. It took a long time for me to have a mob of goldfinches at my feeder. They are finally swarming on my feeder just this winter – almost 2 years after I first started putting out the Nyjer. There have always been a few here and there but not the flocks that my friends described. Be patient – it’s worth the wait! And they do tell their friends…. Dear Elizabeth, Thank you so much for the pep talk. Yes, patience seems to be one of the things I am working on this year. Small steps toward a larger goal. Patience. Appreciation of every step along the way. My friend with the mobs also said maybe feisty and feeder-hogging sparrows are part of the issue. . . more about this in later blogs as I try different things. But I will expect that it may take a while as you suggest. Worth the wait! I grow Sun flowers and I get 20 to 25 Golden finches a year. I have noticed them feeding on my purple zinnias also. Thank you for your comments! My goldfinch quest is starting to pay off! I have a feeder of Nyjer that attracts then, black sunflower seeds in a feeder, and then, as a consequence of the black sunflower seeds, a garden full of volunteer Sun Flowers along side the giant Sun Flowers my son planted intentionally. Zinnias are on the way . . . I cherish every sighting!